Horror movies are a contentious topic for most people — they are either loved or despised. The rush and thrill that comes with a well executed … well, execution, can be breathtaking for the right audience, and uncomfortable beyond belief for others. Despite this tangible split in audience demographics, the genre is highly profitable if the right cards are played. Low budget gore-heavy slasher flicks have flooded the market because of how easy they are to make, often leaving the franchise blockbusters in the dust. There have been very few well-financed horror series entries in the 2000’s, with many that are marketed as such slipping to action status in order to pay the bills. This old-school horror blockbuster series is best represented by Alien. Originating in 1979 with the Sigourney Weaver-led film of the same name, the Alien series has had a confusing and turbulent history. Morphing from sci-fi horror, to action and then apocalyptic thriller, the series took numerous twists and turns until it came to the mystery of 2012’s Prometheus. Ultimately, the attempts at innovation and exploration that Prometheus undertook failed with many audiences, and it seems that in Alien: Covenant, director Ridley Scott decided to go back to the basics. Identical in theme and tone to the originals of the franchise, Covenant seems lost in a past that doesn’t fit in the modern film climate. 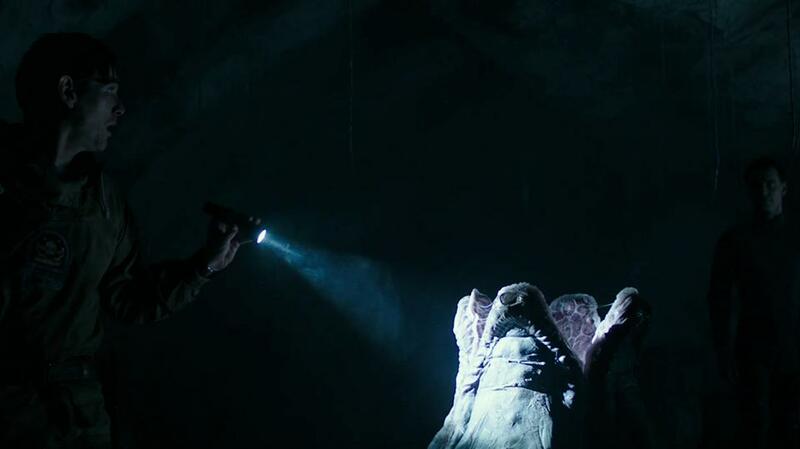 Many original elements to the franchise return in Covenant’s third act, which may well have survived off of a nostalgic high, if it hadn’t been hamfistedly thrust into an otherwise, pardon the expression, alien film. Oram (played by Billy Crudup) finds a little something unexpected in Alien: Covenant. Images courtesy 20th Century FOX. The movie can only be accurately described as a hot mess; mashing together horrible action and infrequent but excessive gore, it has learned all of the wrong lessons from the last decade of horror films. While the film as a whole is incoherent, the cast makes the most with what they are given. Led by Michael Fassbender, returning from Prometheus in his role as both the Weyland Corp. android David, and a newer model, Walter. The film’s best scenes, by far, are those in which David and Walter discuss their introspections about life, and what the very term ‘life’ means. Sufficiently surreal, anytime both of Fassbender’s characters are on-screen together, the rest of the movie seems to pale in comparison. More in celebration of his extensive skill than detriment to his co-stars, but the two best performances in the film were both Michael Fassbender. Next in billing, if not performance quality, is Katherine Waterston as Daniels. Desperately dodging the inevitable comparisons to Sigourney Weaver’s Ellen Ripley, Waterston comes across as whiny and incapable, with only a handful of redeeming moments. The supporting cast, shy of a charismatic Danny McBride, is more flash than substance, without being all that flashy to begin with. Picked off relentlessly in the inevitable grind of a gore-heavy horror movie, they evaporate without consequence, sacrificed to the monsters chasing them for the sheer amusement of it. This task, being a bag of blood, is fulfilled wholly if nothing else. The schizophrenia of Alien: Covenant is its greatest weakness. Moreso than its glacial opening pace or the stunt casting of James Franco (who disappears after 3 minutes, despite promotion), the indecision of the filmmakers about how to approach it drags the film down. Caught between the old and the new, Covenant finds itself delivering poorly on both halves because of the other’s influence.